Lunar Eclipse occurs when the earth comes between the sun and the moon in such a way that it blocks the sun’s rays completely from reaching the moon. New moon is the phase of the moon during its monthly orbit when the moon lies between the sun and the earth. During this phase the dark side of the moon faces the earth hence, it is not visible to the naked eye. Lunar Eclipse only occurs on the full moon night which means that the moon is on the other side of the earth from the sun. This is a celestial event that would only be visible for an hour or so. Since the New moon or the dark moon is the phase of the moon that would normally be causing Solar Eclipse. 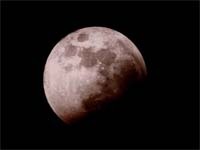 During a lunar eclipse the night would normally start with a full moon and during the course of the eclipse the moon would generally appear red or copper in color due to the sunlight filtered by the earth’s atmosphere but would generally remain visible and then again it would revert to the normal full moon. The new moon actually means that the moon would not really be visible almost the entire night to the naked eye. The first visible crescent of the new moon would generally be visible to the very trained eye just after the sunset. Partial lunar eclipse generally occurs twice a year however the solar eclipse occurs approximately at a gap of 18 months. New Moon state is guaranteed every month. In Chinese calendars the New Moon marks the beginning of a new Month. 1. Lunar Eclipse is when the earth comes between sun and the moon blocking any sunlight from reaching the moon whereas New Moon occurs when during the monthly lunar orbit the moon comes between the sun and the earth. 2. Lunar Eclipse is visible on the entire night side of the earth for a period of almost 1 hour whereas on New Moon, the moon is not visible the entire night. 3. Lunar eclipse is caused on a full moon night whereas it is always on the new moon that the solr eclipse occurs. 4. Lunar Eclipse generally occurs twice a year whereas the New Moon occurs once every month. N Amit. "Difference Between Lunar Eclipse And New Moon." DifferenceBetween.net. November 2, 2009 < http://www.differencebetween.net/science/nature/difference-between-lunar-eclipse-and-new-moon/ >.